The INTERPRACTICE-21st Project promotes the optimal postnatal growth of preterm infants and standardises growth measurement in selected populations around the world. It is based on the implementation of the INTERGROWTH-21st international standards for preterm postnatal growth and evidence-based feeding recommendations based on human milk. Within this project we aim to identify healthcare institutions that provide care to preterm babies and infants and establish an online community of health professionals who are able to apply and widely disseminate the feeding protocol and monitor the postnatal growth of preterm infants using the INTERGROWTH-21st standards. Specifically, we plan to implement the INTERGROWTH-21st growth monitoring and feeding protocols in leading neonatal units around the world and, ultimately, gain high-level health policy support for these practices. 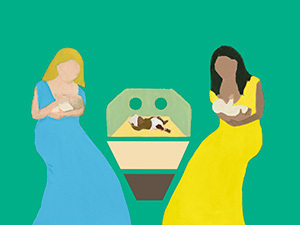 The combination of using recommended feeding practices and international standards to monitor postnatal growth and development of preterm infants should help to: a) avoid nutritional patterns that may be associated with childhood overweight and obesity, and b) improve the growth, development and survival of preterm infants. The International Fetal and Newborn Growth Consortium for the 21st Century, (INTERGROWTH-21st), is a global, multidisciplinary network of more than 300 researchers and clinicians from 27 institutions in 18 countries worldwide coordinated from the University of Oxford. It is dedicated to improving perinatal health globally and committed to identifying fetal and newborn growth restriction, hence reducing the millions of preventable deaths that occur during the first 1000 days of life as a result of preterm birth or poor intrauterine growth. In order to meet this goal, international growth standards to measure and improve maternal and newborn clinical care, and compare outcomes across populations are needed. Such standards exist to monitor the growth of infants and children. They are the WHO Child Growth Standards, and their release in 2006 was a landmark achievement. These scientifically based standards are now used worldwide. However, the fetal and newborn counterpart has been missing, which led to the implementation of the INTERGROWTH-21st Project. The aim was to extend the WHO Child Growth Standards into the fetal and neonatal period, providing tools for continuity of care from conception to 5 years of age. The INTERGROWTH-21st Consortium implemented population-based studies using standardized methods, and clinical research protocols. It gathered a rich body of data on health, growth and nutrition from pregnancy to early infancy from close to 60,000 women and newborns across five continents, making the INTERGROWTH-21st Project the largest collaborative venture in the field of perinatal health research to date. The resulting data provide unique insights into growth and development for the 21st century. The findings also provide new ways of classifying preterm and small for gestational age newborns. In addition, the INTERGROWTH-21st Consortium have produced a new international equation for estimating gestational age by ultrasound early in pregnancy based on the first international crown-rump length standards, and have developed the resources necessary for enabling the adoption and scale-up of these tools at all levels of the health care system. The development of this course was motivated by the commitment of the INTERGROWTH-21st Consortium to improve perinatal health globally. This training course is a practical interactive package targeted at health professionals caring for preterm infants that promotes the INTERGROWTH-21st feeding protocol and the new standards. Large-scale dissemination of the course is implemented with the support of the INTERGROWTH-21st Consortium, the Global Health Network (TGHN), George Institute for Global Health (GIGH), Save the Children, and Maternal Health Taskforce (MHTF) to reach a global population of doctors, nurses and other health professionals caring for preterm infants, plus policymakers. The INTERPRACTICE-21st Project is funded by the Family Larsson-Rosenquist Foundation. Thank you for taking this course. We hope you enjoy it and find it useful. You are required to make an account with the Global Health Network, using your email address and a password, to access the modules and quizzes. We have integrated a number of knowledge tests within each module to ensure interactive involvement from each participant. Follow the instructions on the screen and click all the relevant links so you do not miss out on anything! In each module you will find a link to key documents, tools and articles if you click on the reference button. The last part of the course is the knowledge assessment “Final Quiz” which you are invited to complete. The participants who correctly answer at least 80% of the multiple choice questions are entitled to a course certificate from the Nuffield Department of Obstetrics & Gynaecology, University of Oxford; Harvard Maternal Health Taskforce; The Global Health Network, and the Geneva Foundation for Medical Education and Research. As of December 31, 2018, a total of 789 health professionals from 66 different countries took the assessment test (see INTERPRACTICE-21st/Assessing preterm infant feeding and growth monitoring knowledge assessment test - Participants by country). Monitoring of the implementation of the INTERGROWTH-21st Postnatal Growth Standards for Preterm Infants : Take the Survey.